THE LACK OF ICT ENGINEERS: CURRENT SITUATION AND PERSPECTIVE. With everis' publication of the La falta de ingenieros TIC: situación actual y perspectiva [The Lack of ICT Engineers: Current Situation and Perspective] study, the need to cover scientific-technological positions was brought to light, and we highlighted the scant presence of women within the technological sector. STUDY: FACTORS INFLUENCING THE CHOICE OF SCIENCE, TECHNOLOGY AND MATHEMATICS PROGRAMS. VIEWS OF STUDENTS IN THE 3RD AND 4TH YEAR OF COMPULSORY SECONDARY SCHOOL AND BACCALAUREATE. In 2012, we presented the results of this study, conducted jointly with e-motiva, and with the collaboration of the Government of Catalonia - Department of Education. The study concluded that, among other factors, gender stereotypes, biases and prejudices had an immense impact on the decisions that the students made regarding their choice of degrees in the STEM area. The image assigned (do they think I'm capable? Do they think I'm not capable?) by parents and teachers was key in the chose of STEM degrees. At everis, we created an animated series to generate interest in science and technology, called Noa & Max, together with Pompeu Fabra University (UPF, Spanish acronym) in Barcelona, and with the support of the Fundación Española para la Ciencia y la Tecnología (FECYT, or Spanish Foundation for Science and Technology). This series intends to break the gender stereotypes associated with the STEM fields, thanks to the adventures of Noa, the protagonist, and her brother Max. VOLUNTEER PROGRAMME AND ROBOTICS AND PROGRAMMING WORKSHOPS AT FUNDACIÓN EVERIS. We trained everis employees in creative technologies in order to create the volunteer programme and robotics and programming workshops at Fundación everis. The volunteers at Fundación everis organise and hold different workshops, with which they have an impact on, and bring creative technologies to families in the different countries where everis has a presence, both in Europe and in America. Through this volunteering and workshop programme, Fundación everis influences over one thousand company employees, and we established a scalable design that extends into 10 countries, such as Spain, Italy, Portugal, United States, Mexico, Chile, Peru, Colombia, Argentina and Brazil. Find out about the initiative! STUDY: HOW CAN WE STIMULATE A SCIENTIFIC MIND? We carried out this study in collaboration with Fundación Bancaria “la Caixa” and the Fundación Española para la Ciencia y la Tecnología (FECYT, or Spanish Foundation for Science and Technology), in order to evaluate what impact dissemination activities in the STEM fields had on the interest in studying these subjects. In the sample evaluated, in which over 2,500 Spanish secondary school students participated, the impact of the actions studied was much lower on girls than it was on boys, leading to the identification of necessary improvements in their design and execution. The result of this research provided a tool and a methodology to evaluate the impact of STEM dissemination activities, as well as a recommendation guide for the design and execution of this type of educational programmes and activities related to STEM vocations. This year, we also replicated the "Factors influencing the choice of science, technology and mathematics programs. Views of Students in the 3rd and 4th Year of Compulsory Secondary School and Baccalaureate" study in Galicia, corroborating the conclusions obtained by the study conducted in Catalonia. We trained everis employees in creative technologies in order to create the volunteer programme and robotics and programming workshops at Fundación everis. The volunteers at Fundación everis organise and hold different workshops, with which they have an impact on, and bring creative technologies to families in the different countries where everis has a presence, both in Europe and in Ame Through this volunteering and workshop programme, Fundación everis influences over one thousand company employees, and we established a scalable design that extends into 10 countries, such as Spain, Italy, Portugal, United States, Mexico, Chile, Peru, Colombia, Argentina and Brazil. This study, carried out with Google and the Fundación Española para la Ciencia y la Tecnología (FECYT, or Spanish Foundation for Science and Technology), allowed us to detect that girls are less interested in studying Computer Sciences (CS) than boys. However, the perception of the importance of CS showed no difference between the genders, it is the same in boys as in girls. The results of the report reveal that this difference is due to the influence of fathers and mothers on their children, and especially on their daughters, as gender stereotypes and biases influence the awakening of interests and motivations in girls, who choose to rule out CS. Stemming from the study we conducted, and together with the Fundación Española para la Ciencia y la Tecnología (FECYT, Spanish Foundation for Science and Technology) and Google, we carried out the significant work of training the educators from different Science and Technology Museums in Spain to bring technological content to girls and boys in an attractive, family-oriented way. The experience and conclusions from the studies carried out in previous years led us to create a social initiative with the objective of bringing STEM disciplines, through creative technologies, art and design, to boys and to girls. That was how CLOQQ emerged, an acronym for Crea LO Que Quieras [Spanish for Create What You Want], an initiative that has had an impact on over 30,000 people through its digital platform and the organisation of educational workshops and events with creative technologies. 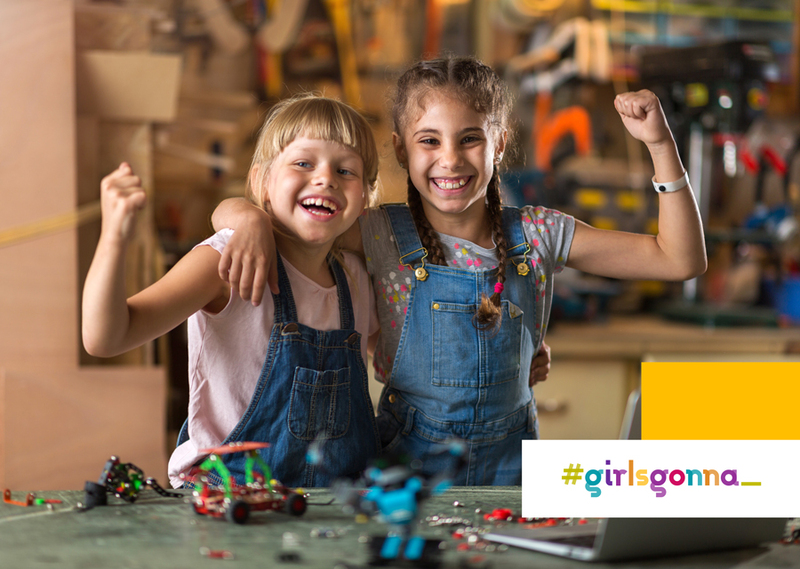 In collaboration with the Mujeres Tech (MTech) Association, and using the Made-with-CLOQQ methodology, we created the #girlsgonna social initiative in order to do our bit for the important mission of reducing the gender gap in the digital sector. In addition, we created a toolkit with a set of resources, references, ideas and didactic material to help any person to join our mission.